Visakhapatnam, also known as Vizag, is a beautiful, fast developing port city and the second largest city in the southern state of Andhra Pradesh, India. It was a fishing village and was named after a God of Velour Visakha, and was under Ashoka's Kalinga empire. During 15th century it became part of vijayanagar Empire. Subsequently, the British converted Vizag into a port, which is the largest shipyard in India today. It is the only natural harbor on the eastern coast of India. Visakhapatnam served as a major trading center for the Europeans, the Dutch, the French and the English. From Lakes to cool Beaches, from beautiful Hill Ranges to Caves and Valleys, Visakhapatnam has them all. Visakhapatnam (Vizag)is a harmonious blend of the magical past and the bustling present. It is also one of the rare towns in India where you find the hills and the sea together. 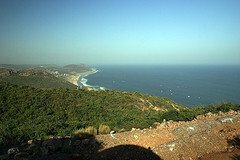 This rocky promontory is a well-known landmark of Visakhapatnam. Bheemunipatnam Beach is located at Bhimli, 24 km away from Visakhapatnam, amidst the blue waters and tall coconut trees. It is a favorite hub for honeymooners. Bhimli is a small town on the coast line that holds its reputation for India's first municipality. This was earlier a Dutch settlement. There are many Buddhist settlements also. 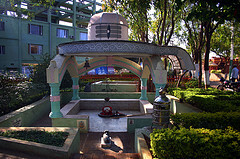 Situated 16 kms from Vizag, this temple is located in the thickly wooded hills. This ancient temple was built by Gangas in 13th century AD, with l6-pillared Natya mantapa and the 96-pillared Kalyana mantapa. These caves were formed as a result of the action of the River Gosthani. Due to the pressure exerted by the river water on the mineral deposits, the lime stones dissolved and gradually solidify to form the irregularly shaped stalagmites formed. Located about 136 km away from Visakhapatnam, this beautiful Hill station is home to aborginal tribes. It has an altitude between 600 and 900 m above the sea level. It is on the way to Arakku Valley. It is famous for coffee plantation. This charming hill is located on a hilltop on the seafront provides a mind blowing picturesque view towards Bheemunipatnam. This beautiful park is situated amidst the picturesque eastern ghats of India, enclosed by hills on either sides and Bay of Bengal on the east. Budget and Luxury Hotels are available. Visakhapatnam has an airport which is well connected to the major cities of India. Visakhapatnam is well connected to the major cities of India by rail. Visakhapatnam is also well connected to all major cities of India by Road.